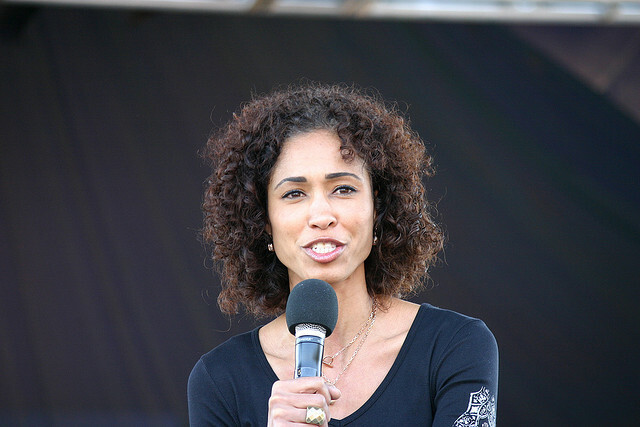 ESPN SportsCenter cohost, Sage Steele. Women are taking over sports. In what has traditionally been a male profession, women are rising through the ranks and doing a great job. You too can be a sports broadcaster, host or president of a sports network. Three women are taking charge and playing ball. Kathy Carter is the President of Soccer United Marketing, Major League Soccer. Part of her success comes from having a soccer background. She was a starter on William & Allen’s nationally ranked soccer team during college. Upon graduation, she went to work for Booz Allen Hamilton as a consultant. Eight years later, she applied to work for the World Cup and was accepted. Today she is in charge of marketing for 19 teams, 18 stadiums and soccer fans galore. Another fabulous female in sports is Sage Steele, from Indiana University, who is now a cohost of ESPN’s SportsCenter. Steele is one of only four female co-anchors on ESPN’s daily rundown show. She was chosen to cover the NBA Finals, one of the most popular sporting events of the year. Being a female on the show does come with some issues. She often gets hit on by male guests, or they assume she won’t know about sports. That’s why she works so hard to deflect that assumption. Every morning she goes over stats, scores and analyses for at least three hours. Charlotte Jones Anderson is the Chairwoman of the NFL Foundation. She knows that some people believe she only got her job because her father, Jerry Jones, is the owner of the Dallas Cowboys. However, she won people over when she was the executive vice president of the Cowboys and got NBC to air the team’s Thanksgiving halftime show. Last year she was chosen, by NFL Commissioner Roger Goodell, to lead the league’s NFL Foundation. She basically works to promote health, safety and community initiatives.